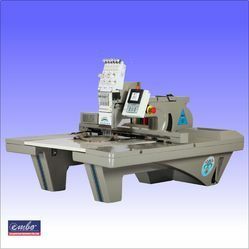 We offer a wide range of embroidery machinery that is applicable in boutiques and tailoring parlours. Our embroidery sewing machines add the ability to add beautiful additions and embroidery accents to any sewing or fabric. Embroidery speed maximum - *800 Stitches per minute. *Embroidery speed varies as per embroidery conditions. Floor area - 4.2 feet x 3 feet. Embroidery frame attachments available for doing small logo's of 5" x 5". Moreover motifs of 21" long lengths can be joined together to make saris borders & long sherwani's. We reserve the right to change the specification for improvement without prior notice. Embroidery quality varies with type and cloth used and quality of digitizing Kindly check samples as per requirement.